The moment I entered my new friend’s apartment, I could tell that Gabby was the life of the party. I burned calories just watching her enthusiastically engage in activity — turning cartwheels, parading her fashion dolls and savoring her fries and fish sticks. Her eyes twinkled with a million thoughts and unanswered questions, which she eventually directed at Siri, when her mom required a reprieve. The sight of Gabby doing hula-hoop gyrations on the balcony, as she later waved good-bye to me, made me burst out laughing. Her Mom rolled her eyes, “She definitely blows any of the middle child theories!” Her joy seemed unstoppable. I marveled even more when my friend explained that though Gabby had missed a much-anticipated playtime at the Romp ’N Roll gymnasium that afternoon, she had taken the disappointment remarkably well and had almost immediately started to celebrate how much she was going to enjoy it when she would get there the following week! On my drive home, Gabby continued to fill my thoughts due to one of her million questions which had stayed with me. It was innocent enough, but had flushed up darker questions of my own. Though a believer in Jesus, I often found myself embarrassed by my own lack of sparkle, vim and zip. This dark train of thought had come by way of Gabby asking if my mother had a nickname for me. She had at least two and I had spat them out in quick reply, caught up in the preschooler’s zeal. “Yes, she called me, ‘Les Miz’ or Abizdid!”. We all laughed. At the first, because of the association with the classic, Victor Hugo’s ‘Les Misérables’ and at the second, because it was such a fun, onomatopoeic, nonsense word. Later, however, as I drove home, old concerns that I had not been characterized by joy even from childhood, nibbled afresh at the corners of my mind. Preachers often make a point of admonishing their congregants to not present a dour face to the world. “Jesus laughed a lot! Little children would never have been so drawn to Him had He looked like He had been sucking on lemons!”, I heard one minister express. So, what did it mean for me, that the first personality test I ever took classified me as ‘melancholic’ and that the most recent revealed me to be the only family member who had little to no ‘Otter’ (party animal) in my personality profile? It seemed I did not reflect the joy of Jesus. Let us fix our eyes on Jesus, the pioneer and perfecter of faith. For the joy set before him he endured the cross, scorning its shame, and sat down at the right hand of the throne of God. I realized that subconsciously I had always read that passage as teaching that Jesus saw joy way, way over in the future, and used that future joy to endure life here on earth. This passage confirmed that although He had difficult times to endure and shame to bear, He was able to keep His present suffering in perspective by living in anticipation of that future joy. Gabby’s childlike example underscored why Jesus said we would not enter His Kingdom unless we become as little children. Her somersaults and round-offs that day anticipated the even greater joy she fully expected the following week. Though there may have been sorrow when the disappointment was fresh, her broad smile belied any sense of enduring; she was already there, rompin’ and rollin’, fully trusting her Mom that ‘it’ would come to pass and that ‘it’ was going to be amazing! 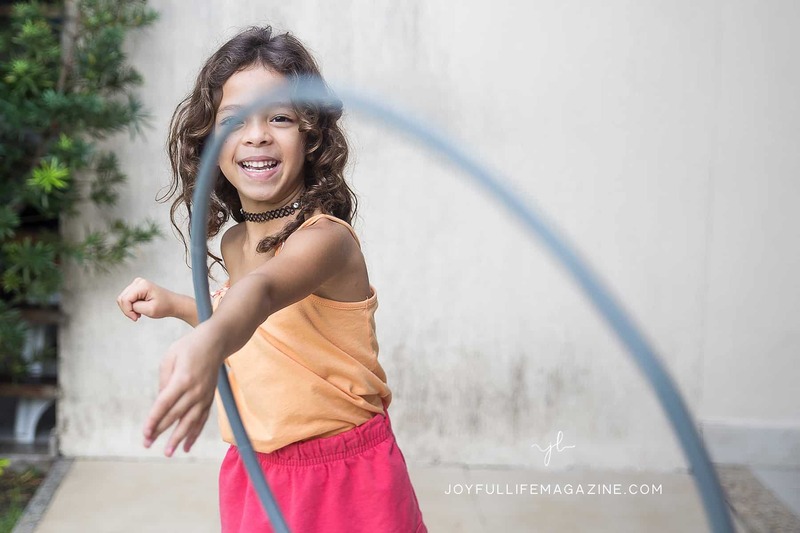 I gave thanks for this fresh reminder, though as I sought to press bravely into my day, I still felt a hovering sense of dissatisfaction with the idea that I did not exude joy; I have never been the hula-hoop-gyrating, somersaulting type — not even when I was four! I knew I was engaging in the folly of comparison, and to a child no less, yet still yielded to the weakness. The sorter and order-lover in me reached to remove a piece of blue note paper that jutted from a journal I was putting away. It was a four-year-old note from a single, young adult friend, written just prior to her leaving to embark on foreign missionary adventures with God. I am sure I must have expressed some wistful longing regarding her mission trip — for she had written, encouraging me with Scripture. My heart quickened as I sensed the personal nature of this communication from God by way of this old note. I savored it for a moment then opened my current journal to slip it in. That’s when I encountered two other notes, handed to me the previous year at a church workers’ Valentine event. One, written by choir director, Joan, spoke of ‘seeing Jesus in my eyes’ – ‘inviting, welcoming, tender’, were some of her words. The other, from a vivacious youth-leader-Mom, spoke of feeling comforted when she was around me by what she described as my “gentle way”. If my middle-aged hips would have cooperated, I would have turned a cartwheel right there in the middle of the family room floor! My service and spiritual worship did spawn joy…viewed from perspectives a little beyond pre-school! Overwhelmed with emotion by the Father’s impeccable timing and ability to orchestrate circumstances, (even old notes!) for our good, I laughingly lamented my vulnerability and shallow memory and tearfully gave thanks for His clear affirmation of who He created me to be. How unwise it is to believe that this awesome Creator God, who is also a consuming fire, is not capable of perfecting His image in His children. He, through our obedient response to Him in the midst of life’s trials, burns away the dross and brings forth His own nature in us — the fruit of His Spirit, through any personality type, and at any age. Gabby brought smiles to my face, my young friend spreads the joy of the salvation through Jesus Christ in far away places, and our presence and service bless our homes, fellow believers and neighbors. Jesus gave Himself to the full range of human emotional experience — He wept over Jerusalem, angrily routed avaricious vendors from the place of prayer, sang hymns, lavished love on His disciples by washing their feet, groaned in intense prayer, entreated a traitor, compassionately healed an enemy’s ear, anguished over separation from His Father, and forgave a fellow convict — all within a week’s time, mere hours and minutes before finally surrendering to torture and death on the cross. His trust in the promise of the Father, the bringing of “many sons to glory”, focused and sustained Him through it all. His joy was found in the prospect of our ultimately being transformed into His likeness: resembling Him! This was the reward of His suffering, the joy that was set before Him. His joy was found in the prospect of our ultimately being transformed into His likeness: resembling Him! This was the reward of His suffering, the joy that was set before Him. He saw and welcomed us then and is now seated at the right hand of the Father, savoring and anticipating an even greater future consummation of joy, with all who are seeking to find their joy in HIm. I am Denise Armstrong — worshiper. My purpose is to glorify God by enjoying Him in all of His Creation, among His People, His Bride, the Church; accentuating His glorious Bridge of reconciliation — the Cross of Jesus Christ — through words laced with His Truth, and cast abroad in the world He loves, and died and lives again to save. ​ I was born and raised Jamaican, where I also received my formal education at Shortwood Teachers' College and the University of the West Indies, specializing in English Language & Literatures in English. The remainder of my education was gained through homeschooling our three wonderful children (Joseph, Charis and Timothy) and parenting them with my husband Claude. My passion is worship expressed primarily through writing inspirational pieces that urge readers not to miss how much the Lord has "cramm'd earth with heaven", to quote Elizabeth Barrett Browning. My heart is to encourage community, in the best sense of the word, through exalting the cross of Calvary. I enjoy reading, writing, cooking, gardening, theatre and ballroom dancing (only with Claude!) and digging into the Word of God. You can read more over at Dawnwings. This was an awesome read, thank you for sharing. I think so many pastors focus on how joyous Jesus was. However, we are all made in His image, so he has all the personalities we all have, including your beautiful personality.